Seaway Trail, Inc. has named Michael “Mike” Bristol as its new President and CEO. The Great Lakes Seaway Trail is a 518-mile, two-state National Scenic Byway, a New York State Scenic Byway, and a state-designated Bicycle Route in New York and Pennsylvania. Bristol becomes only the second President and CEO in the Great Lakes Seaway Trail’s 34-year history. The Seaway Trail scenic driving route was designated in 1978. The Seaway Trail, Inc. nonprofit organization formed in 1986 with Teresa Mitchell as its first director. Mitchell passed away in January and Charles “Chuck” Krupke served as Interim Executive Director. Mike Bristol began his new leadership role July 2, 2012. He brings nearly 30 years’ experience in tourism, athletics and nonprofit management to the tourism and economic development organization based in Sackets Harbor, NY. A Florida State University graduate, Bristol was the Associate Director of his alma mater’s Seminole Boosters, Inc., a national-level fundraising corporation. He served as President and CEO of the Tallahassee Area Convention and Visitors Bureau from 2002 to 2005. 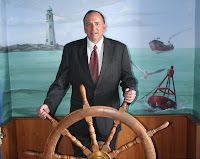 Upon returning to his native northern New York, Bristol served as Director of Marketing and Outreach for The Antique Boat Museum on the Great Lakes Seaway Trail in Clayton, NY. Bristol is a member of the Clayton Local Development Corporation Redevelopment Committee that is overseeing a new dock and hotel development. The Great Lakes Seaway Trail organization is known for diverse travel theme marketing, a “Best of the Byways” guidebooks series, Great Lakes Seaway Trail “Outdoor Storyteller” signage, and innovative programming that includes a American Volkssport Association-approved series of War of 1812-theme walks. Popular travel themes include scenic driving road trips, maritime and military history, four seasons’ outdoor recreation, birdwatching, lighthouses and shipwrecks, bicycling, quilting and cultural heritage. To learn more about the Great Lakes Seaway Trail byway that runs alongside the St. Lawrence River, Lake Ontario, Niagara River and Lake Erie in New York and Pennsylvania, go online to www.seawaytrail.com. The University at Buffalo Libraries has announced a new exhibit, &#8220History of Technology in Western New York&#8221 at the 2nd Floor, Oscar A. Silverman Library, Capen Hall, University at Buffalo North Campus. Researched and written by Nancy Schiller, Engineering Librarian, and produced by Rose Orcutt, Architecture & Planning Librarian, &#8220History of Technology in Western New York&#8221 offers a glimpse into Western New York’s rich industrial heritage. The exhibit pays homage to Buffalo’s iconic grain elevators, to Pierce-Arrow and its sleek automobiles and even sleeker advertising, to the region’s contributions to early aviation, and to the massive steelmills in Lackawanna, and the men and women who labored in them. Photographs, text and images featured in the exhibit recallan era when 50 percent of Buffalo’s population was engaged in industrial endeavors of one sort or another, and factories, grainelevators, blast furnaces and steel refineries dotted the local landscape. Inspiration for the exhibit came from a recent UB Honors Seminar taught by Professor John Van Benschoten, Department of Civil, Structural, and Environmental Engineering. The course explored the role of Buffalo, Niagara Falls, and Western New York in our nation’s history, and provided students with an opportunity to consider the history of Western New York and its future through anunderstanding of technology, and the benefits and costs that come with it. The exhibit is open during regular library hours and runs through May 31, 2012. Fillmore, the 13th President of the United States, was a co-founder of the University at Buffalo and the school’s first chancellor. The university has conducted a memorial ceremony annually since 1937. The United States Military honors former presidents by laying wreaths sent by the current president at their gravesites on the anniversary of their birth. The New York Army and Air National Guard traditionally conduct the wreath layings at the graves of President Chester A. Arthur in Menands, Albany County- President Martin Van Buren in Kinderhook, Columbia County- and Fillmore. 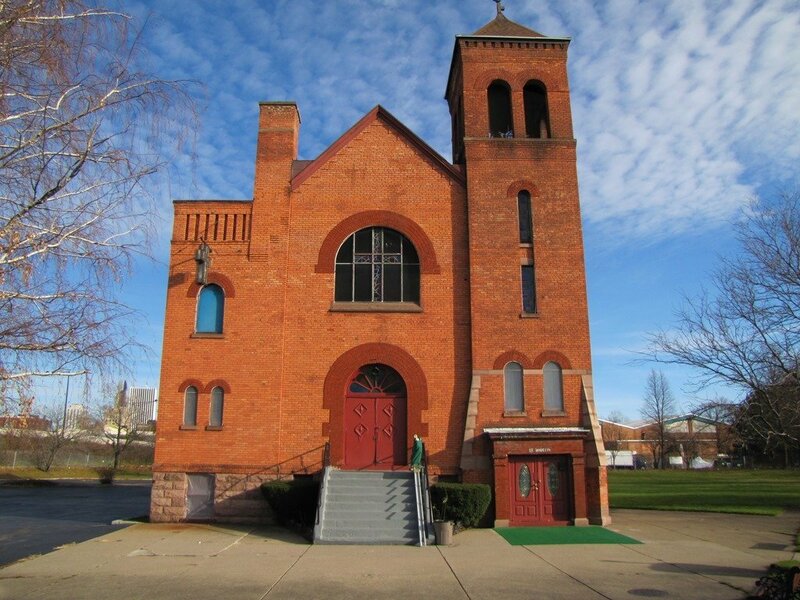 Born on Jan. 7, 1800, Fillmore was instrumental in founding the Buffalo & Erie County Historical Society, the Buffalo Club and the Buffalo General Hospital. His activities also led to the creation of the Buffalo and Erie County Public Library, the Buffalo Fine Arts Academy and the Buffalo Society of Natural Sciences. Some historians credit the former teacher, postmaster, lawyer and member of Congress with establishing the White House Library. During his administration the United States opened trade relations with Japan and California was admitted to the union. He died on March 8, 1874. The 107th Airlift Wing, which is based at Niagara Falls Air Reserve Station, operates C-130 Hercules cargo aircraft in support of United States military operations worldwide. Individual Airmen also deploy regularly to locations around the world. 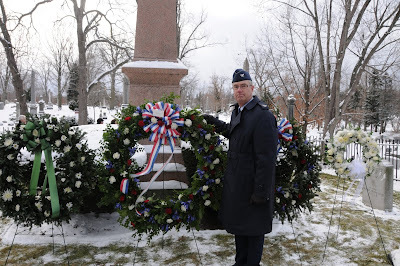 Photo: Col. Jim McReady, commander of the 107th Airlift Wing, presented the wreath at the Millard Fillmore grave in 2011. 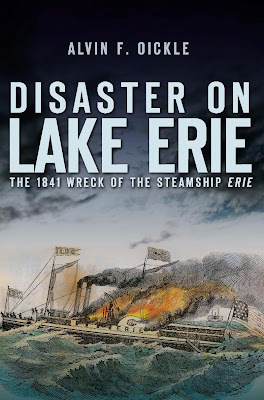 Alvin F. Oickle, author of Disaster on the Potomac, Disaster in Lawrence, and Disaster at Dawn, will be on hand at Buffalo and Erie County Historical Society on Thursday, May 19, 1:00 to 3:00 p.m. to sign copies of his new book on a historic Lake Erie disaster. On August 9, 1841, the steamship Erie, one of the most elegant and fastest sailing vessels between Buffalo and Chicago, departed, carrying 343 passengers. Many were Swiss and German immigrants, planning to start new lives in America’s heartland- most never made it. The Erie erupted in flames during the night, and, despite the heroic efforts of the crew of the Dewitt Clinton, 254 lives were lost. As news of this disaster spread, internationally renowned artists and writers, including Horatio Alger Jr. and possibly James Fenimore Cooper, wrote about &#8216-John Maynard,’ a fictitious, heroic helmsman. 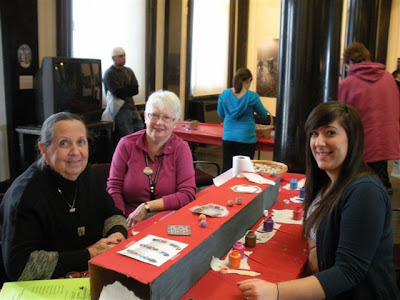 On Sunday, May 1, from 1 to 4 pm, the Buffalo & Erie County Historical Society, 25 Nottingham Court, Buffalo, will host their first 2011 Family Day, presented with support from Northwest Buffalo Community Center. All ages are welcome and the grand opening of the newly refurbished Pioneer Life Gallery will be featured. Visitors may watch and/or join students from the Aurora Waldorf School in a historic May Pole jig &#8212- the traditional May Pole dance ends up with ribbons festively woven around the pole. Additional entertainment and activities will also include: historic blacksmith and weaver demonstrations- pony rides- celebrate spring- learn about the historic May Day celebration- period arts and crafts for all ages- face painting- museum tours- local vendor tables. Tickets are $5/member, $10/non-member. Adults are free with children’s paid admission. Adults unaccompanied by children (all are welcome) are also $5/member, $10/non-member. Want to attend the 2011 National Trust for Historic Preservation Conference in Buffalo from October 19 – 22, 2011? If you work in a New York State non-profit organization such as a library, college, or community-based group, you are eligible for a special Go! Grant. These grants are offered to encourage cross-discipline learning and cross-organization collaboration, these special Go! Grants provide up to $500 to cover travel and registration costs to the conference. This opportunity is only available for New York professionals working for non-profits outside of the museum field. Applications are due on June 1, 2011. To learn more visit www.museumwise.org. In collaboration with Journey’s End Refugee Services and CEPA Gallery, Buffalo & Erie County Historical Society presents &#8220Buffalo: Through Their Eyes,&#8221 photography by international refugees living in Buffalo. For their silver anniversary, Journey’s End asked recently arrived refugees to document the experience of adjusting to life as Buffalo’s newest residents. The participants received disposable cameras and training from CEPA Gallery. Their resulting images, reminiscent of early photographs of the ancestors of fellow Buffalonians, capture intimate moments in their homes, workplaces, communities- in essence the details of &#8220their&#8221 Buffalo. Twenty-five images from the &#8220Buffalo: Through Their Eyes&#8221 project will be displayed from Friday, April 1 to Sunday, June 26, in the Historical Society’s Community Gallery. Admission to the gallery is free with paid museum admission. There will be an opening reception, which is free and open to the public, on Sunday, April 3 from 12 to 5 pm. 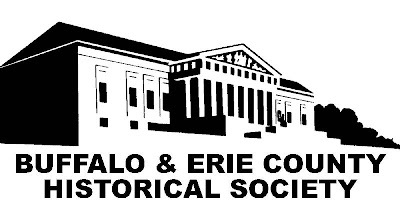 The Buffalo & Erie County Historical Society is seeking docent tour guides, volunteers for community outreach programs, assistants for special events and research team members. Those interested in learning more about the programs can take part in a free orientation and training sessions this spring. The dates are Saturdays, April 9, 16, 23, or Saturdays, May 7, 14, 21 &#8212- each session starts at 10 am and goes until 2 pm. Attendees should bring a lunch. Each session will provide guided tours of exhibits by museum education staff. Volunteers and tour guides may be college students or older- and should have flexible schedules. There is an ongoing need for weekday tour guides. To register, contact Tara Lyons, Program Manager, at 873-9644 x311 or bechsedu@bechs.org. For more information, see www.buffalohistory.org. Photo: Buffalo and Erie Volunteers. The Susan B. Anthony House celebrates Rochester pioneers, both past and present, at its annual birthday luncheon on Wednesday, February 16, 2011, with the theme “What Happens in Rochester Changes the World. Keynote speaker is Dr. Elaine Marshall Sorensen, author, educator, advocate, and historian, who is currently Director of the Center for Nursing Scholarship at Georgia Southern University. A popular presenter at national and international conferences, Dr. Marshall will inspire one and all with lesser-known but vital aspects of Susan B. Anthony’s life and work as well as insights into Rochester’s role in changing the world. The Presenting Sponsor for the event is Van Bortel Ford—Van Bortel Subaru. Also featured at the event will be Janis F. Gleason, author of the new and comprehensive biography of Kate Gleason, an eminent Rochesterian, daughter of the founder of Gleason Works, friend of Susan B. Anthony, and pioneer for women in the field of engineering. The biography will be available for purchase at the luncheon and Ms. Gleason will autograph books after the luncheon at 1:30 p.m.